I had a bad wreck earlier this year. I was on a trip, a few states away from home. My bike was totaled and I was unable to walk for a few months. 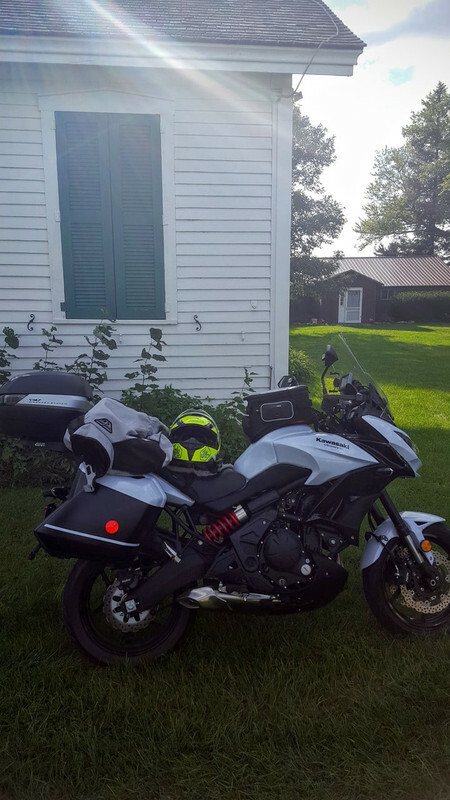 After spending a lot of time debating whether I would ride again, I purchased a new bike, and lots of gear, before I could even walk. Being interrupted during my trip left me in an odd state, it was as if I could have no closure until I went on a trip again. I was obsessed with it. I mapped & planned, anxious to get on the road again. I purchased gear (through the mail, it was hard to leave the house), kept what fit and resold what didn't. One day I felt good enough to ride. So, even though my wife was quite scared (I could hardly walk! 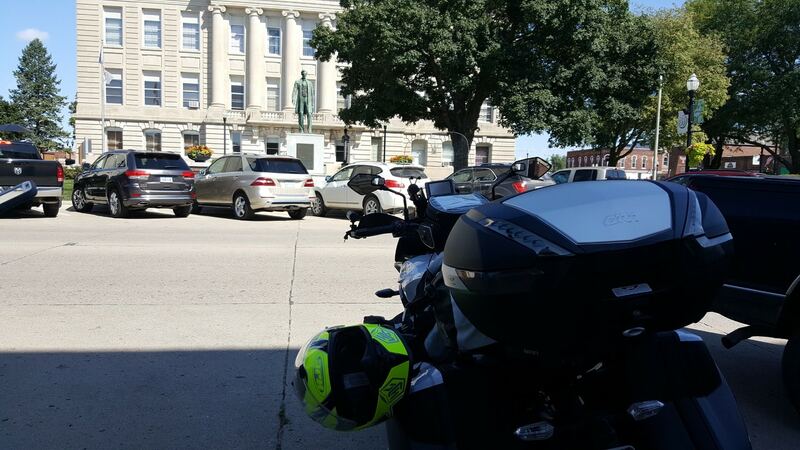 ), I got on my CBR250 and took it around the block. It felt so good to be on the bike again. I did that a few times over the next two weeks. 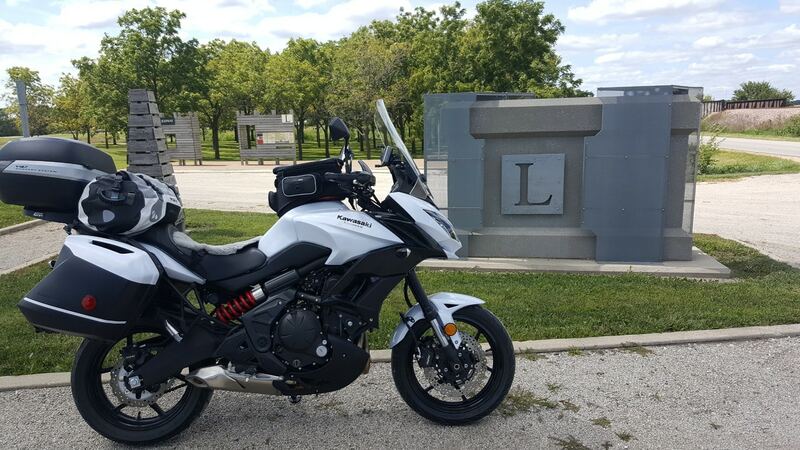 Finally I was ready to try my new bike, which I had not even ridden yet (a 2015 Kawasaki Versys 650 LT). It was much heavier than my CBR, I'm glad I started on the 250. 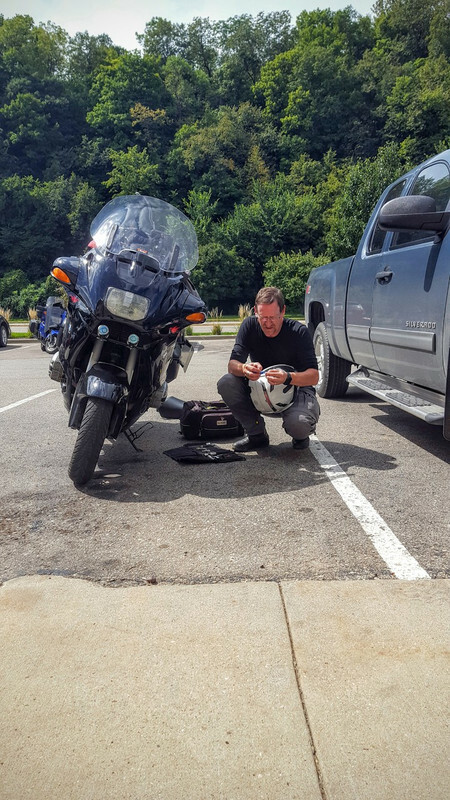 I managed to put a few hundred miles on the Versys, enough to be close enough for the break-in oil change. 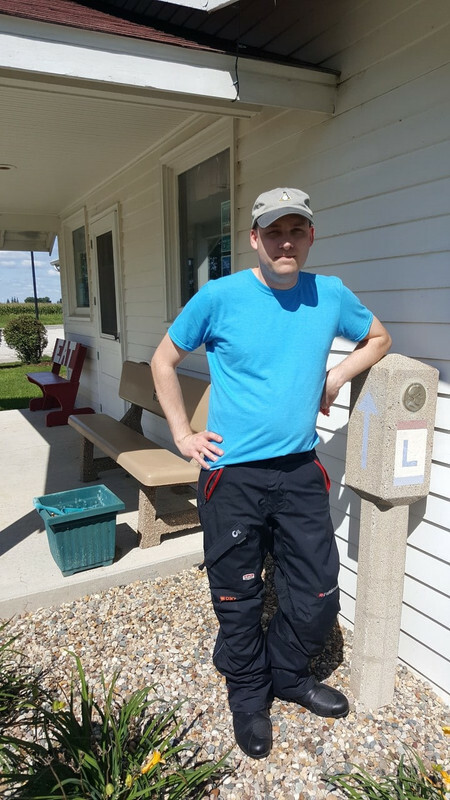 Then on Labor day, I set out on my first trip since the accident. 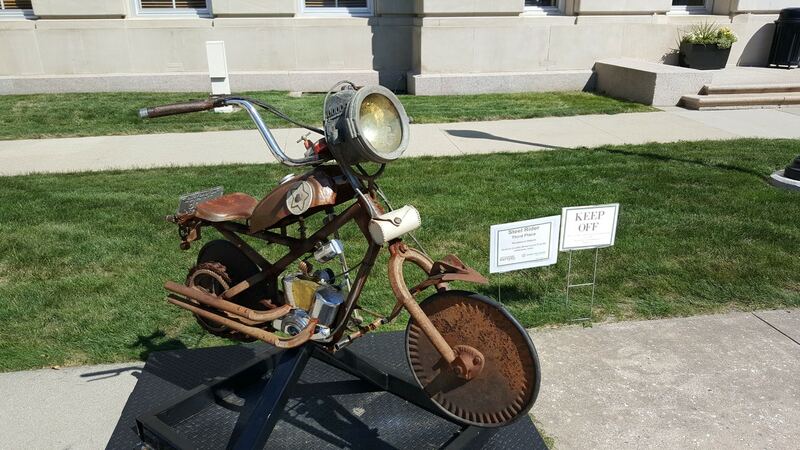 I have always been interested in the history of transportation. I find it interesting to visit old roads, gas stations, train depots, and the like. 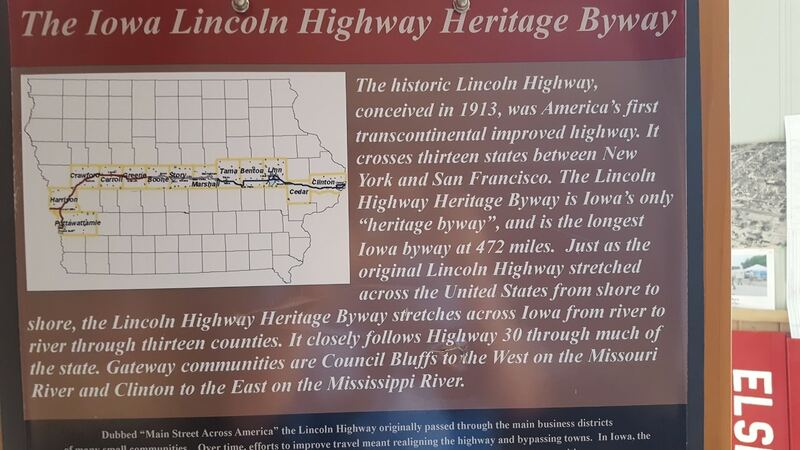 I had heard of the Old Lincoln Highway before, but during my recovery time I studied it further. 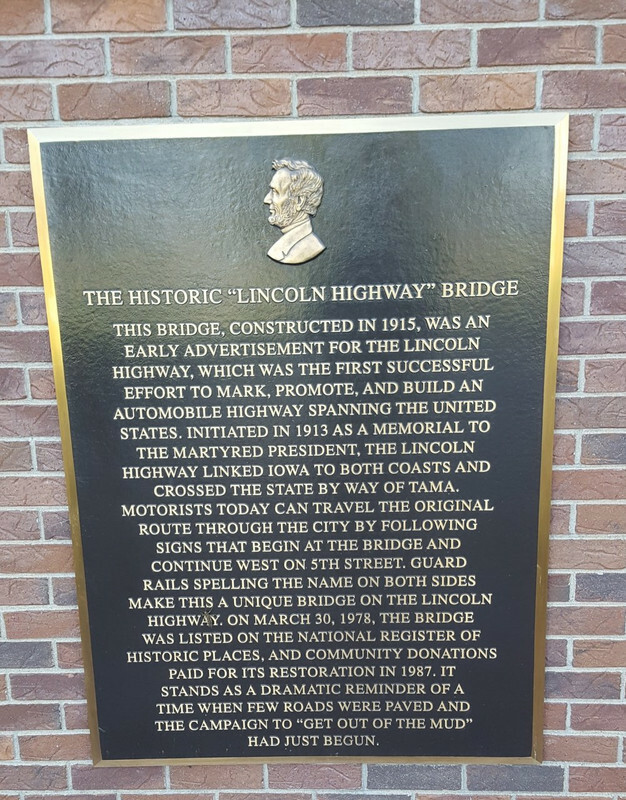 The Lincoln Highway was the first transcontinental highway across the United States. It was inaugurated in 1913 and ran from San Francisco to New York. It cuts across Iowa, which is my home state. I now live nearby in Nebraska. 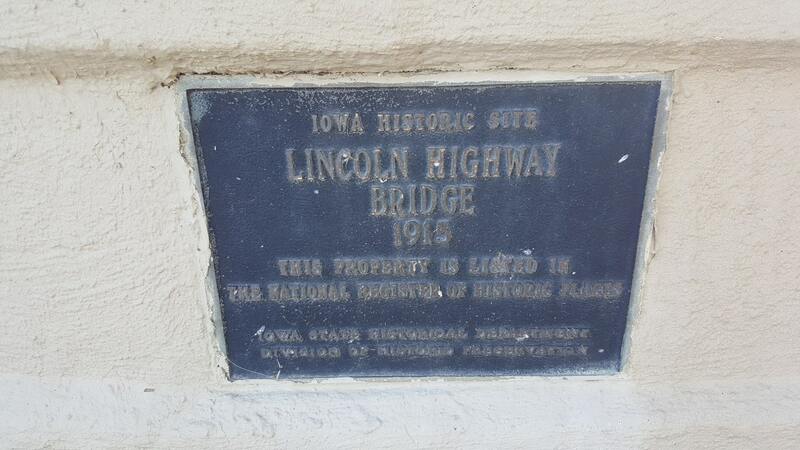 So I decided my trip would be to follow the old Lincoln Highway across Iowa. I would follow it as closely as I could, stopping at anything interesting on the way. My Dad and my friend Mike would come with me. 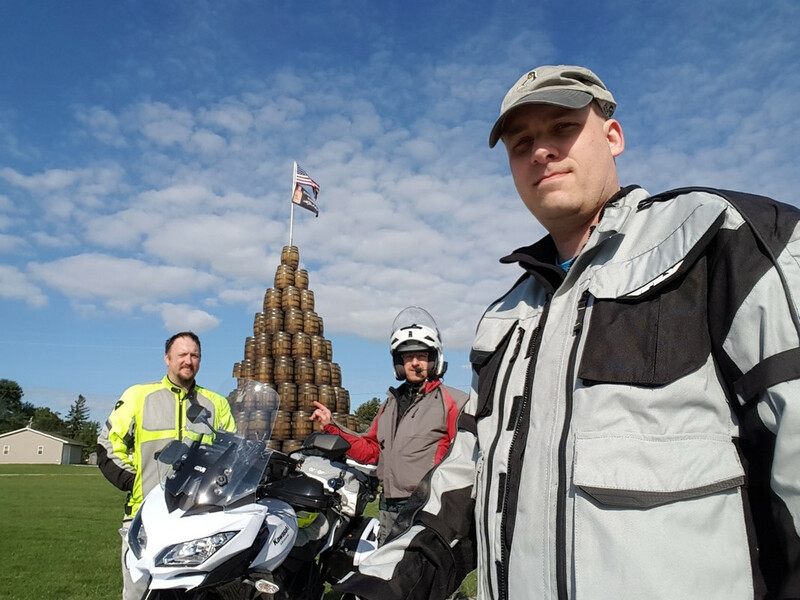 Our first stop was at a German Hausbarn near Manning, IA. This building is over 350 years old and was brought here from Germany. Unfortunately there was construction and we found it difficult to get close. They have a small campground on site that is only $5 per night. Our next stop was not far away, at the Templeton Rye headquarters in Templeton, IA. There is a lot of history here, the family was making moonshine during prohibition. They have an amazing visitor center, and they were very friendly. I tried to explain that we had a long day ahead of us and didn't have much time but they insisted on showing us around. 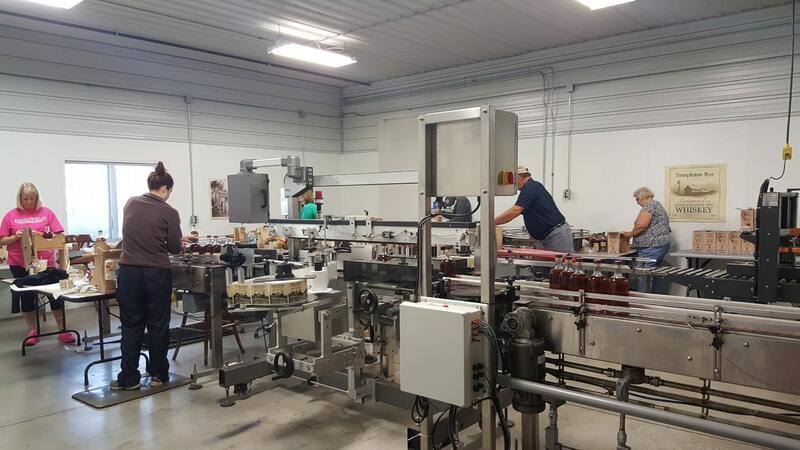 Watching the workers & machinery apply labels and fill bottles was very interesting. And that room smelled so good! And they did offer samples but we did not partake. 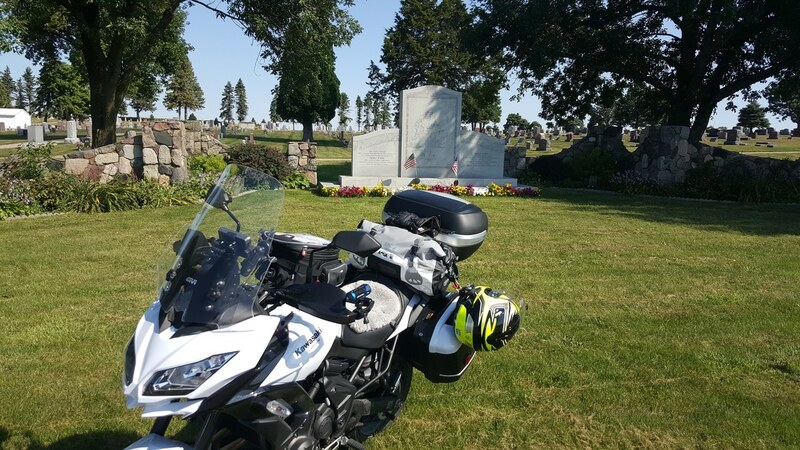 The next stop was the memorial and burial site of Merle Hay on the edge of Glidden, IA. Merle Hay was one of the first three Americans to die in Word War I. He voluntarily enlisted soon after the war started, and was deployed overseas only 6 weeks later. I wanted to visit this site because I've heard the name Merle Hay my whole life but never had any idea who he was. I have family in Des Moines, the state capital of Iowa, and I remember taking the "Merle Hay Road" exit when visiting them. 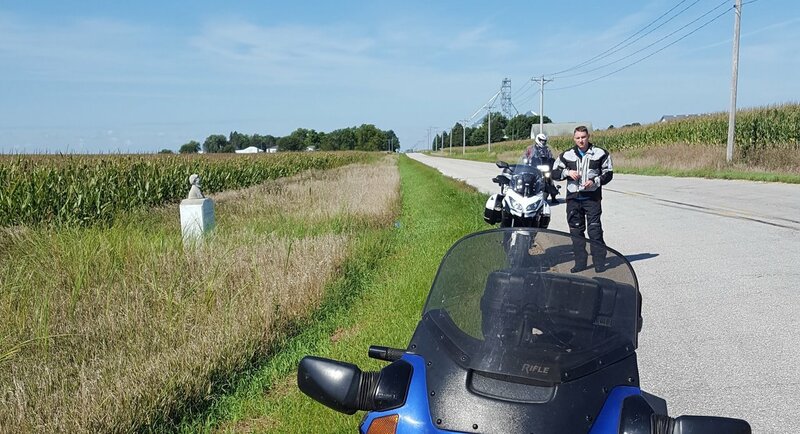 We continued East on Old Lincoln Highway until we got to the Moss Markers outside of Scranton, IA. James Moss was a civil war veteran who admired Abraham Lincoln. 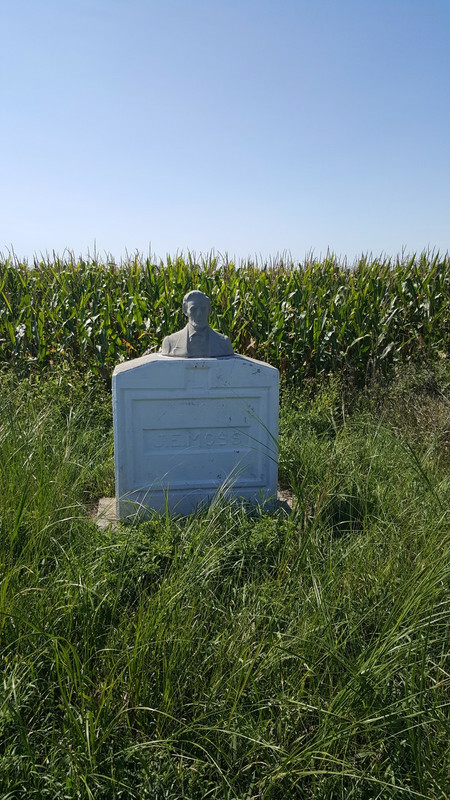 When the county wanted to curve the highway across the corners of his field, he agreed, if they would place busts of Abraham Lincoln, whom he called "one of our greatest citizens", on the curve. 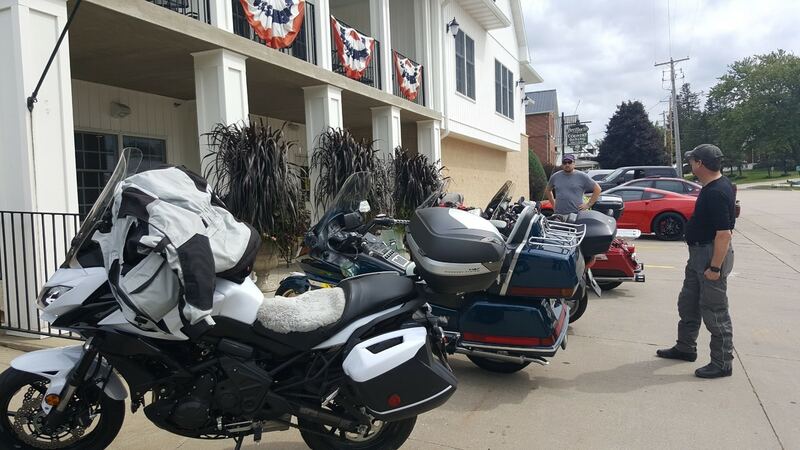 Next we rode to Jefferson, IA. 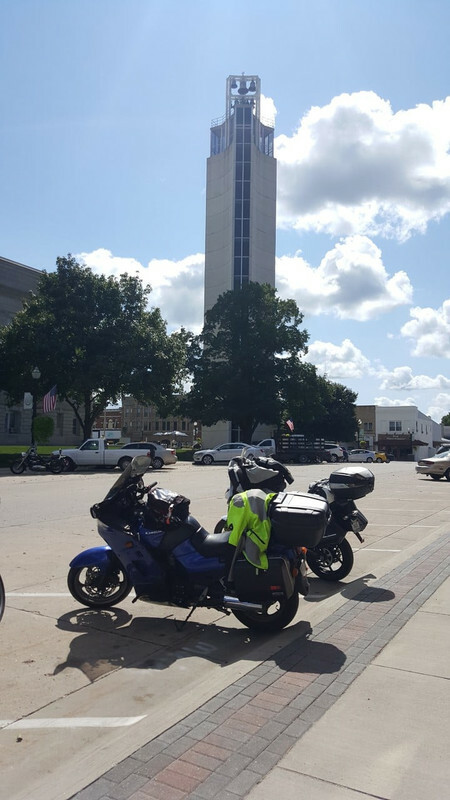 I wanted to see the statue of Lincoln that is outside the courthouse, and see the Mahanay Bell Tower. It's actually a Carillon bell tower, if you are into music you might know what that means. We took the elevator to the top and enjoyed the view. Last edited by zirconx; 11-23-2016 at 10:50 PM. They had winners of a recent art contest outside. The rules of the contest required the sculptures to be made from "junk". I thought this motorcycle turned out pretty good. 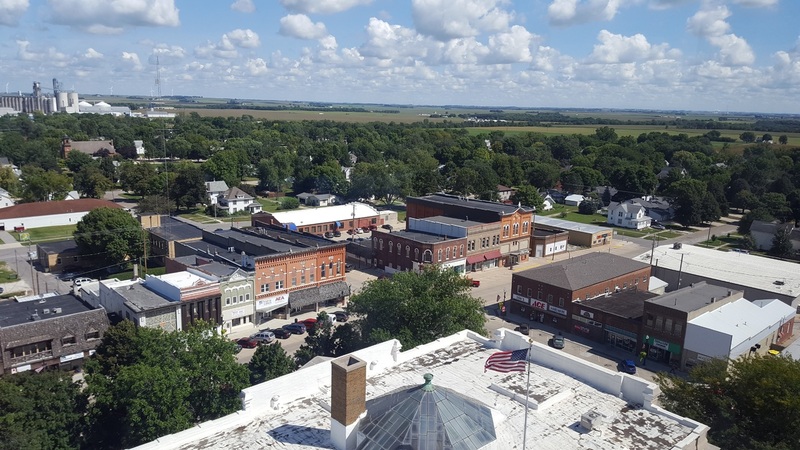 View from the Mahanay Bell Tower. 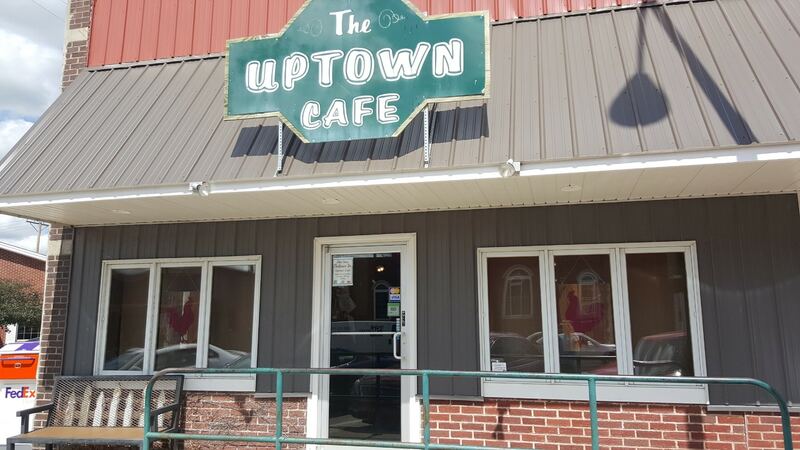 After coming down from the tower, we had lunch and the nearby Uptown Cafe. I had the Lincoln Scrambler. 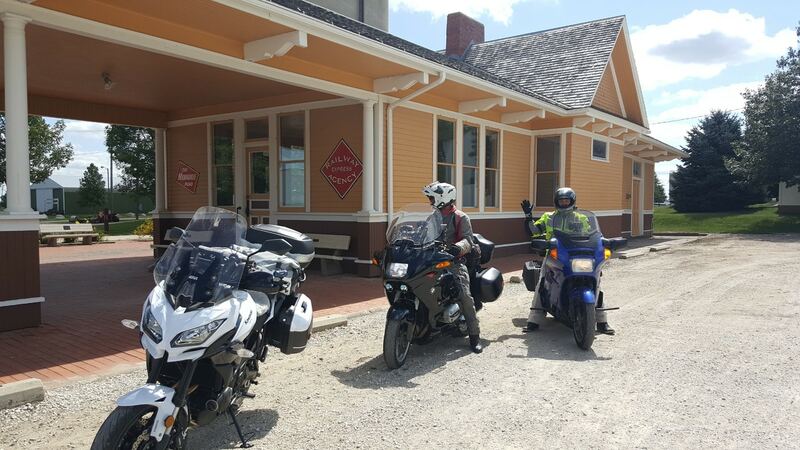 On the way out of Jefferson I saw this beautiful old depot and turned around to get a picture. Then across the street from the train depot I found this amazing mural. 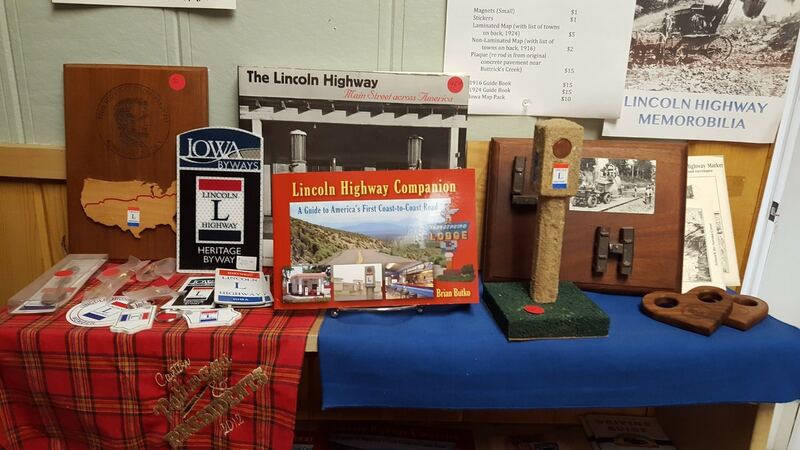 There are several Lincoln highway museums along the way. This one was in Grand Junction and is basically in a large hallway that led to a beauty parlor. There were 4 old ladies in here playing cards. We asked them some questions but they said they didn't know much about the highway, and were only there because they were offered space to play cards if they would keep an eye on the place. 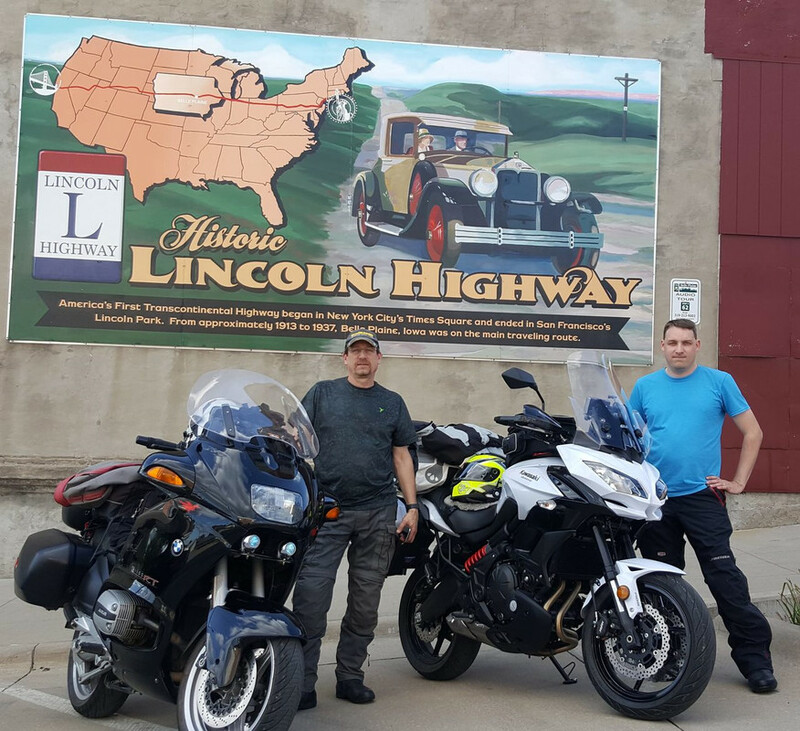 Just east of Grand Junction is The Lincoln Highway Interpretive Site. 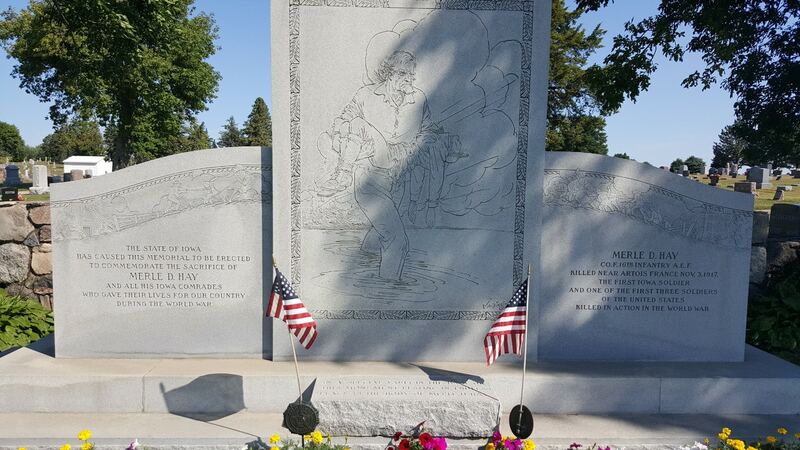 The celebration of the Lincoln Highway is still alive and well, this site just opened in 2014. 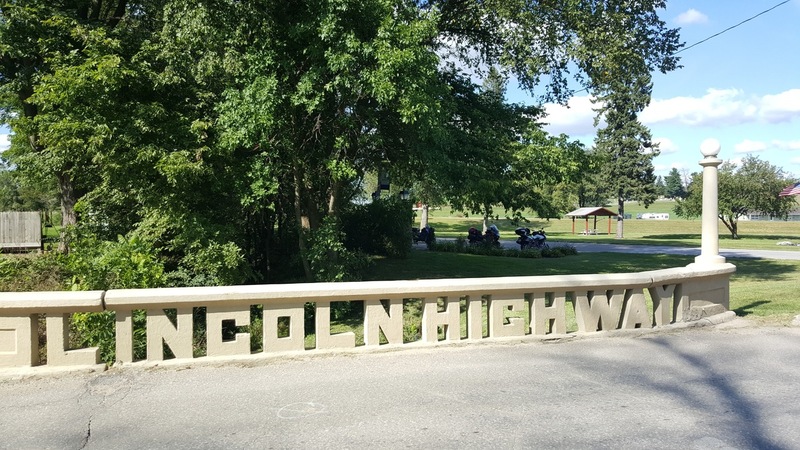 There are lots of things to read here about the history of the Lincoln Highway and transportation in general. 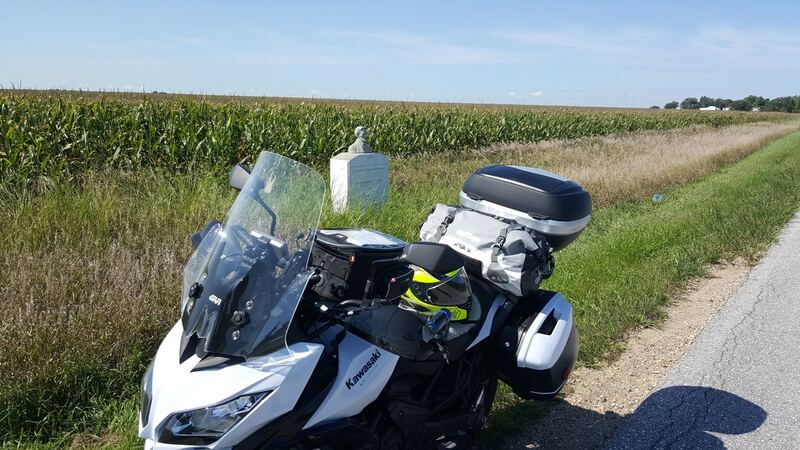 Next stop was the "Reed-Niland corner", near Colo Iowa. 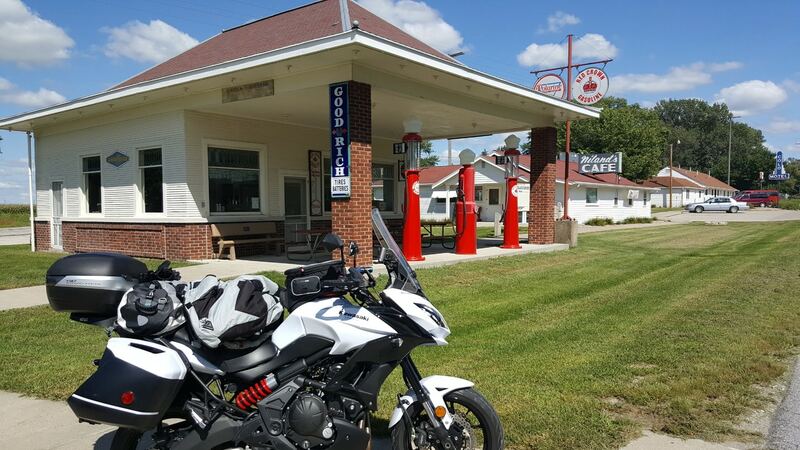 This old gas station, restaurant, and motel is located at the intersection of the Lincoln and Jefferson highways. 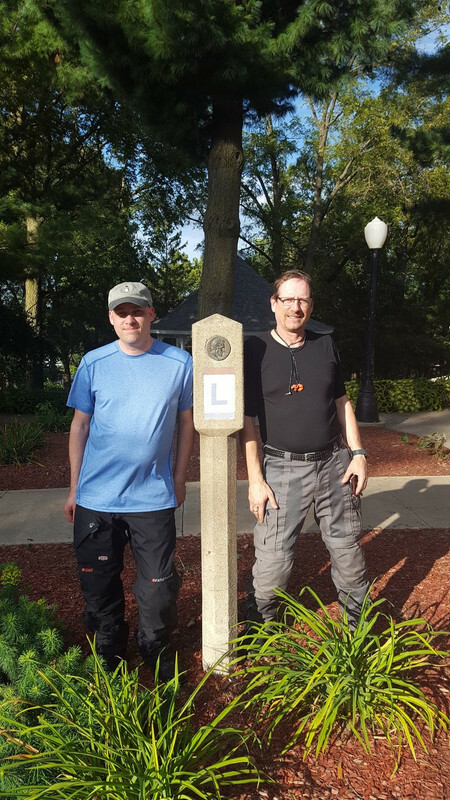 We found our first Lincoln Highway marker here! These concrete markers were installed in the 20's by the Boy Scouts of America (I'm sure they had help). They weigh over 200lbs each and have an inset bronze medallion. Many have been stolen or destroyed. 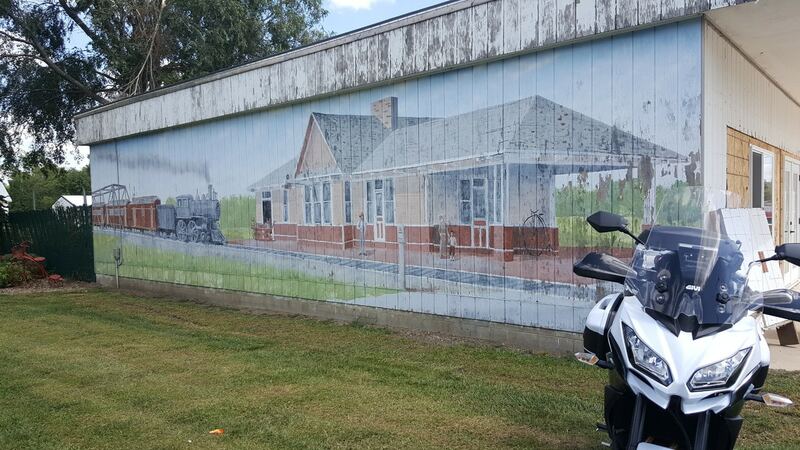 You will hear trains often as you travel along the Lincoln Highway. 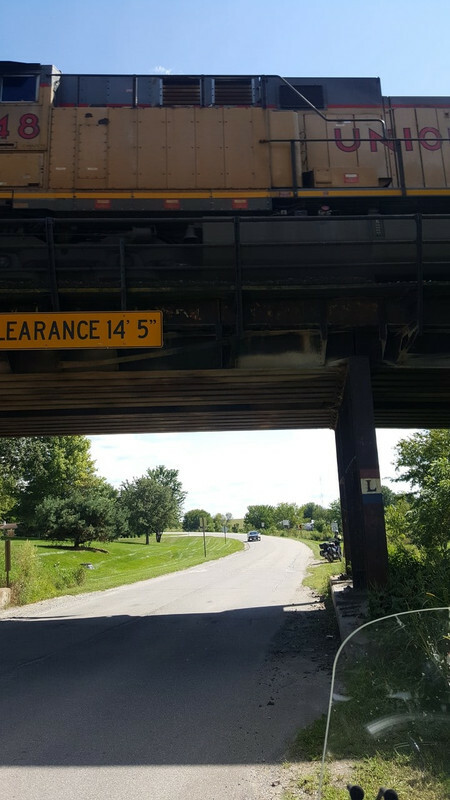 In Iowa at least, it mostly followed the Union Pacific Railroad. 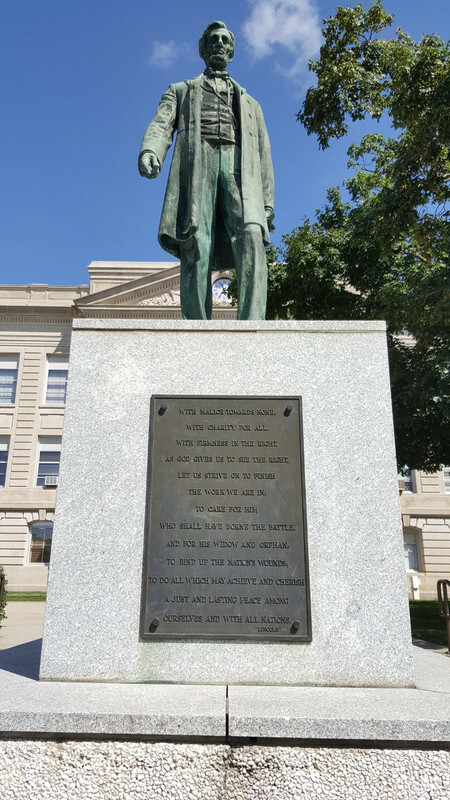 I took this picture in State Center, IA. 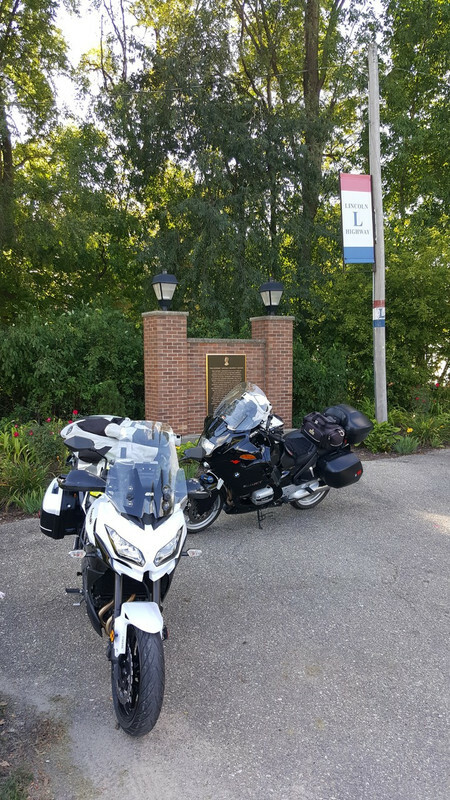 Note the "L" sign marking the old Lincoln Highway. We rode on to Tama to see a see a very old bridge. There was a nice area to park and there is a picnic shelter nearby. I love this picture. Just a few weeks after we were here a heavy truck hit the bridge and damaged it! The driver left the scene. weljo2001 and CyclopsRider like this. 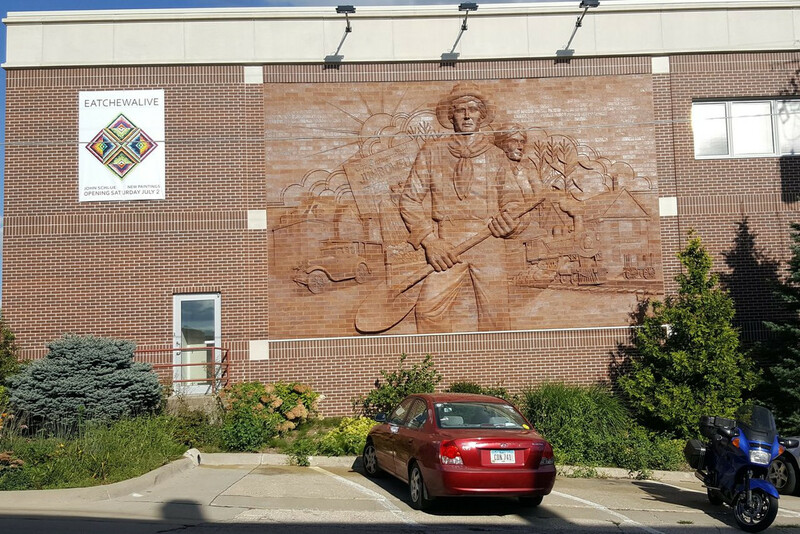 On to Belle Plaine where they have a large history museum with a section on the Lincoln Highway. They were closed, but the art on the side of the building was worth the stop. And this mural was across the street! There was a farmers market nearby starting in 10 minutes. It was getting late and we had to setup camp that night, so I really didn't want to wait. But there were some delicious looking kolaches at the first table. We tried to talk them into selling before the bell rang, but she couldn't be convinced. By the time we were done discussing if we should wait or not, it was almost time to open. So we waited and bought what we thought would be our breakfast (more on that later). 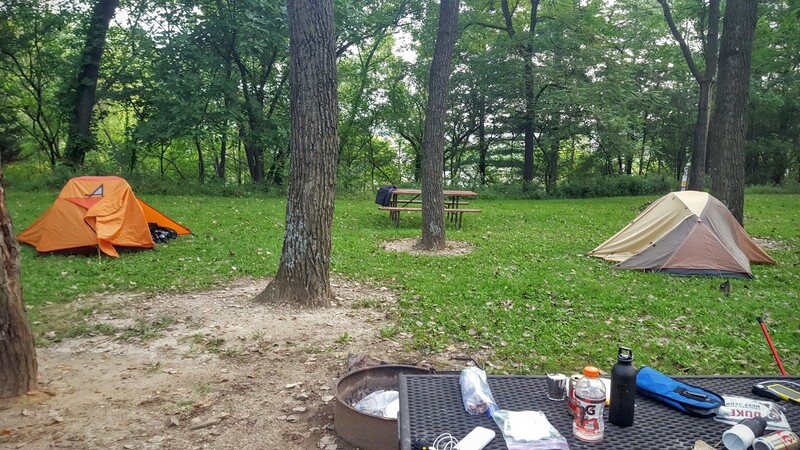 We made it to Coralville Lake near Iowa City. We were tired, it had been a long day. We setup camp and then rode to find some food. We found a Subway and took it back to camp. It was dark by the time we pulled in. The next morning we woke up to find our kolaches WERE GONE. Some four legged critters had helped themselves to them. My friend Mike was sleeping in a hammock tent, he had heard them digging through our stuff and was afraid they were going to come over and attack him through the bottom of his hanging tent, ha ha. We rode to Mt. Vernon for breakfast. It was a popular place and took almost an hour to get our food. Mt. Vernon is home to Cornell College, which was founded in 1843. The entire campus is on the national register of historic places. We left Mt. 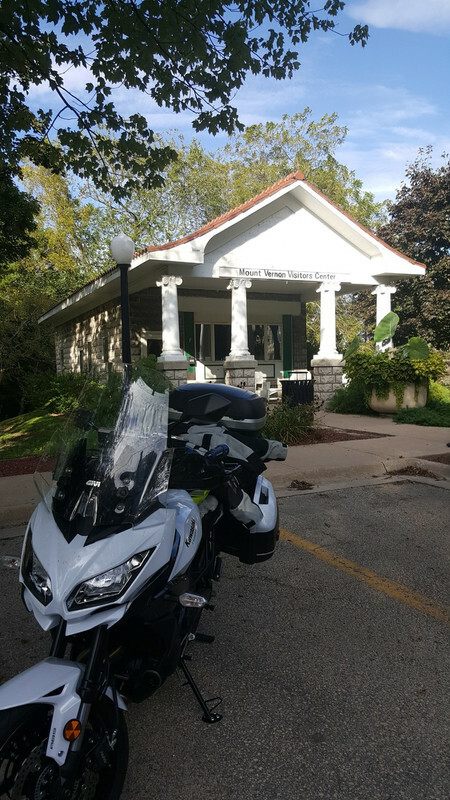 Vernon heading North and rode to Maquoketa Caves State Park. 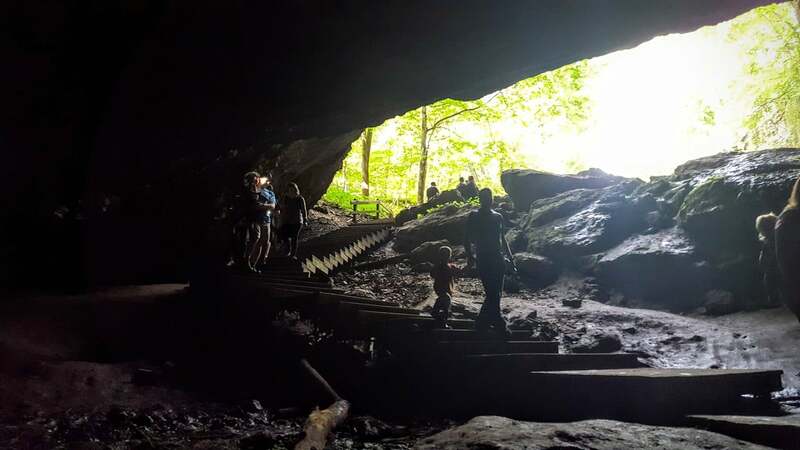 There are many caves in this park. 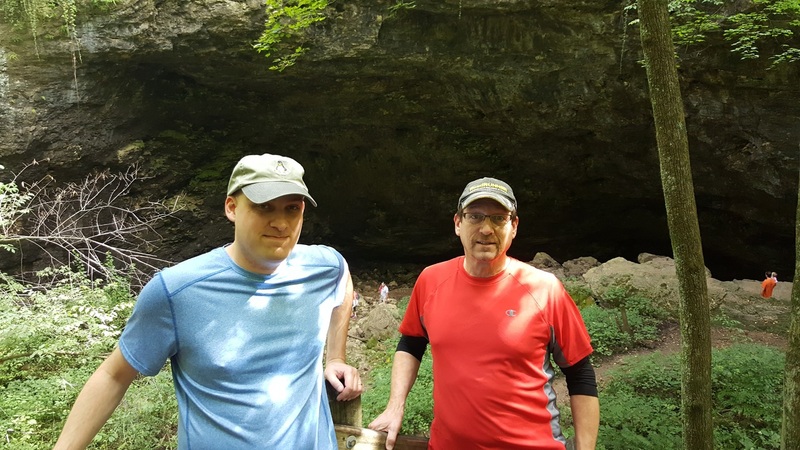 We didn't have a lot of time but we went through the biggest one, called Ballroom Cave. We followed it until it got smaller and smaller, until we were walking hunched over for quite a ways. Then it opened up again, then up many steps, until we were on the other side of the roadway! We had crossed underneath the main road that cuts through the park. Later that day we made an unscheduled stop at a hardware store in Dubuque so my Dad could preform helmet surgery. One of the screws in his flipup helmet had worked loose, leaving it unsafe. The ride in on highway 151, descending towards the water was beautiful. 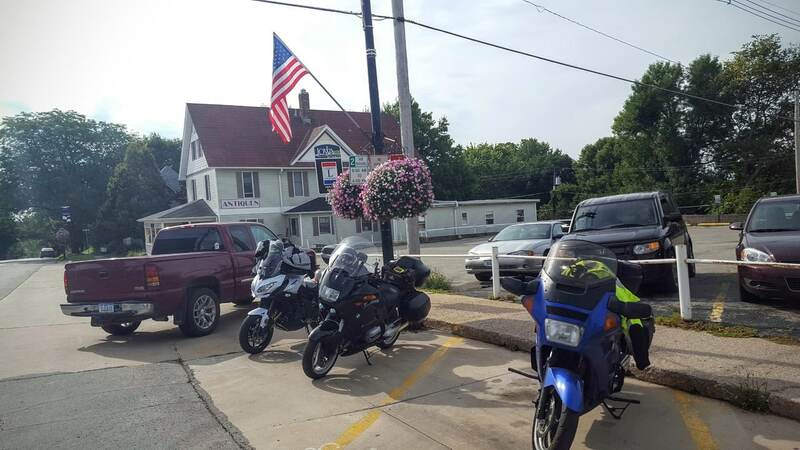 After Dubuque we rode to Balltown, IA for lunch at Breitbach's Country Dining. This is the oldest bar in Iowa, although it has burned down two times now. It's huge and the food is great. 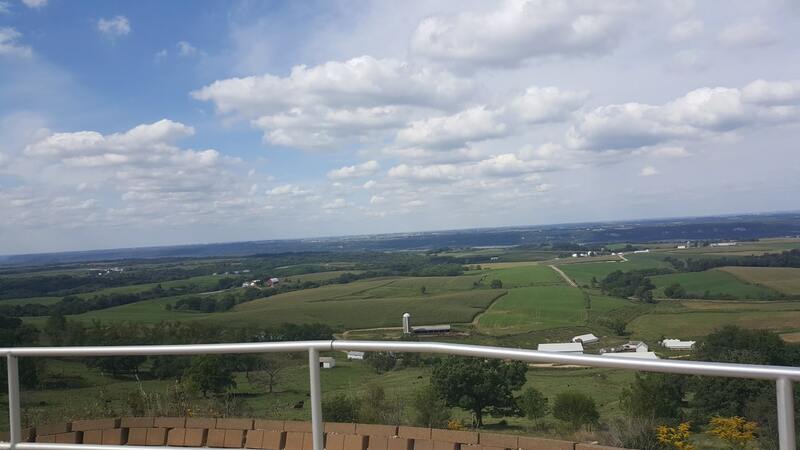 Heading out of Balltown towards the West, there is a scenic overlook. Pictures can't describe. I said to myself many times on this trip "This is so beautiful!". The rolling country side, small farms, lush green valleys. 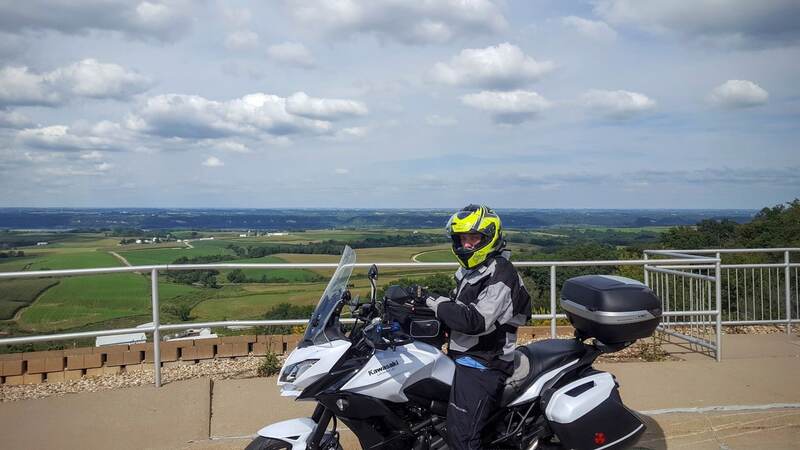 Eastern Iowa is great riding. Heading back to the campground later that day, we were looking for a park or someplace to take a break. I saw something that looked like it might work and pulled in. 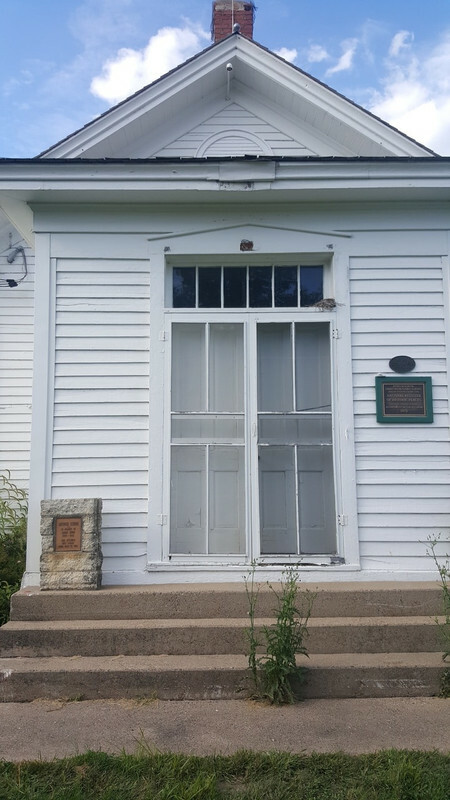 Turns out this is the school house where Grant Wood attended. Grant Wood is the painter of that famous painting with the old couple and the pitchfork, "American Gothic". We made a quick stop in Mt. Vernon as we passed through again, I knew there was a beautiful park and a Lincoln Highway marker here somewhere. 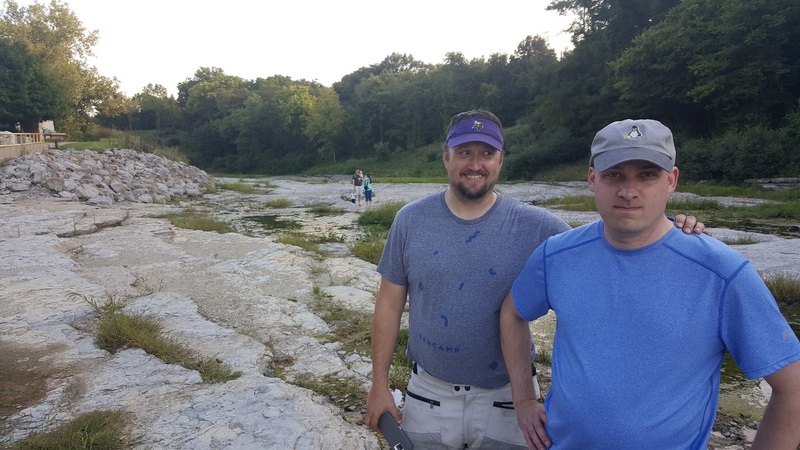 Back at the campground, we decided to check out the fossil bed nearby. It was discovered when a flood washed out a lot of the campground back in the 90's. 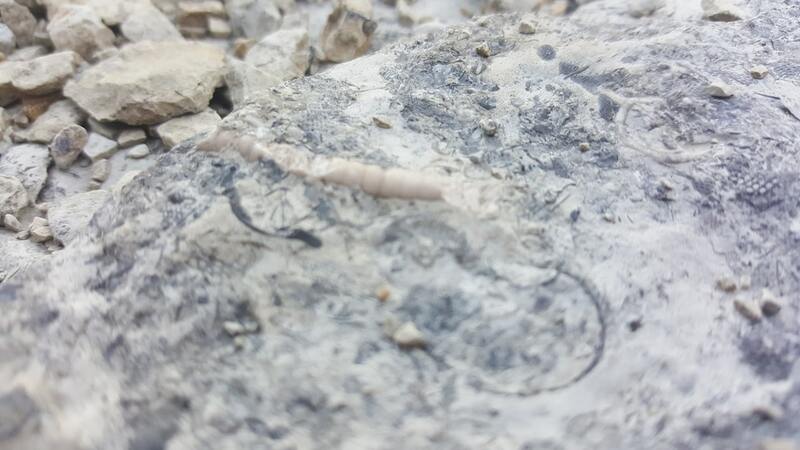 I had never seen fossils like this, it was really cool! My Dad started collecting some to bring back until I pointed out the sign mentioning a $5000 fine for taking any. 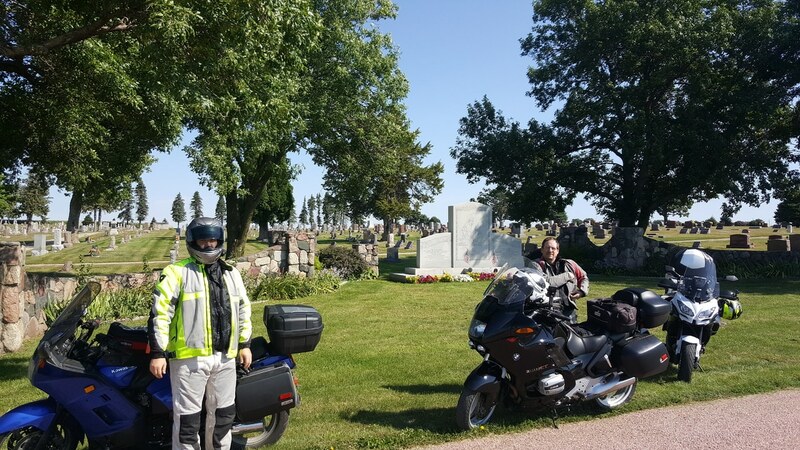 We made it back to the camp ground, decompressed for a bit then decided to ride to get supper. 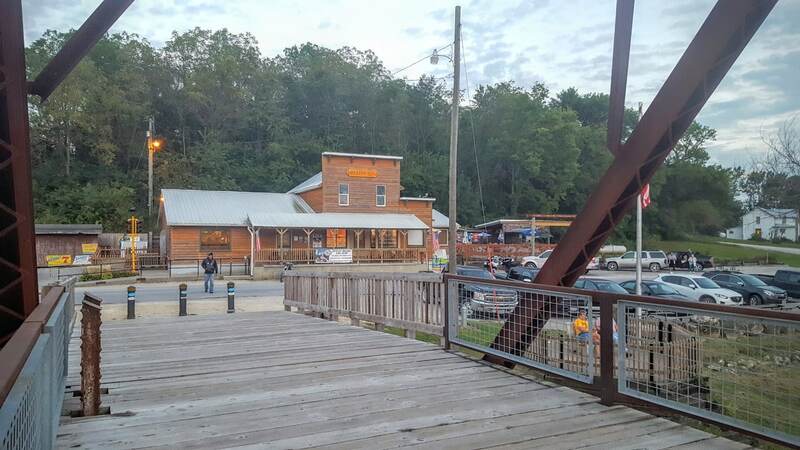 I had heard of a kinda-famous place not too far away called the Sutliff Bridge and Tavern, located near a historic old bridge. Well the GPS couldn't find it, and neither could Google maps. But I had seen a sign for it earlier that day, so we headed north on Highway 1 out of the campground, and watched for the sign. I finally spotted a small street sign that pointed to Sutliff road. It was a small sign so by the time I could read it I was past the turn. We turned around and started following Sutliff road. This was a thin slice of asphalt, in fact it didn't even really feel like asphalt in some places, more like glued together crushed rock. About this time we were starting to loose our light. So we slowed down. We were all tired and hungry at this point, and starting to get a little cranky. I heard over the radio "I'll be very surprised if this actually leads anywhere...". 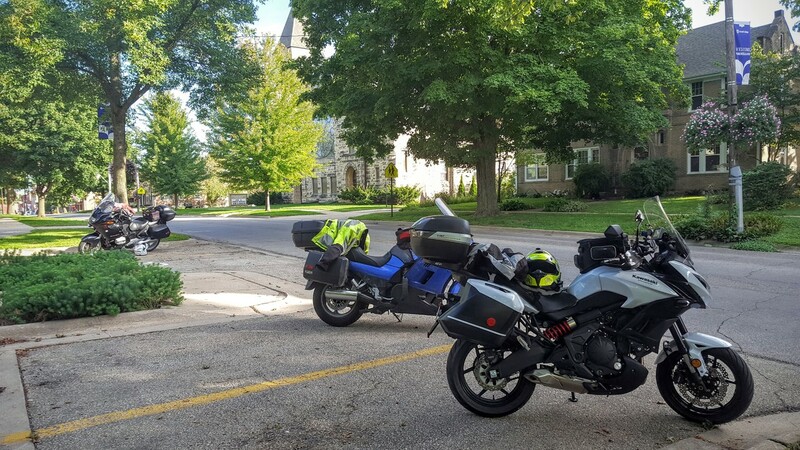 About 10 minutes later we passed some motorcycles going the other direction, and my spirits lifted. Finally we connected to a larger highway, which went right to Sutliff. That was the road I was trying to find, not this little tiny road that was probably the way there 60 years ago! 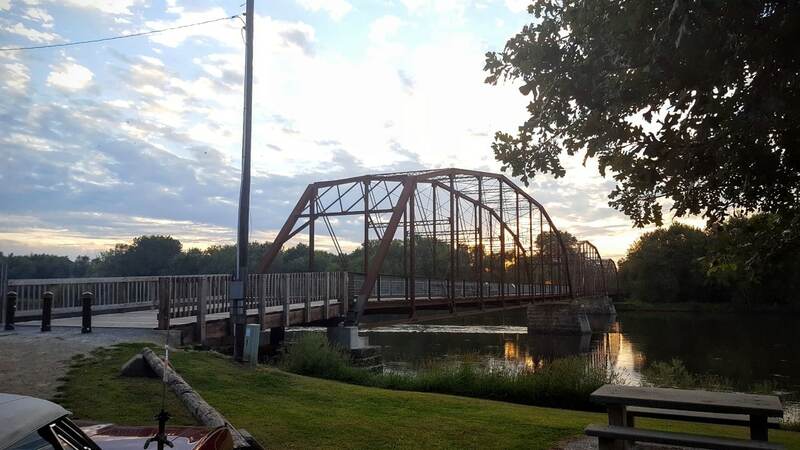 It was an awesome place and the bridge was neat. You could tell it was a place where people from all over the area come to hang out. BTW the reason Garmin and Google couldn't find it is because the town of Sutliff was dissolved long ago! This area is still referred to as Sutliff but it's no longer incorporated. The next day my friend Mike headed back home, my Dad and I headed to Mason City to visit some family and stay there for the night. Then headed home the following day, still avoiding the interstate for 90% of the trip. I had such a wonderful time. 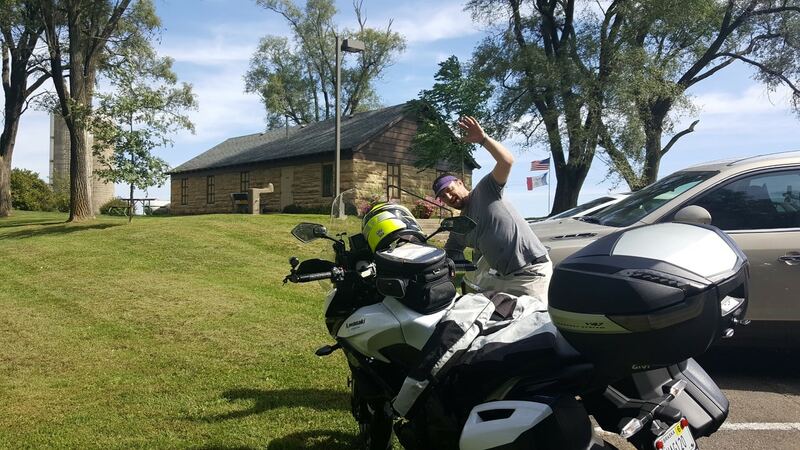 I really debated not riding again, but I enjoy motorcycle adventures so much, I can't imagine living without it. turn8a, weljo2001 and CyclopsRider like this. Nice read.....thanks for the ride. 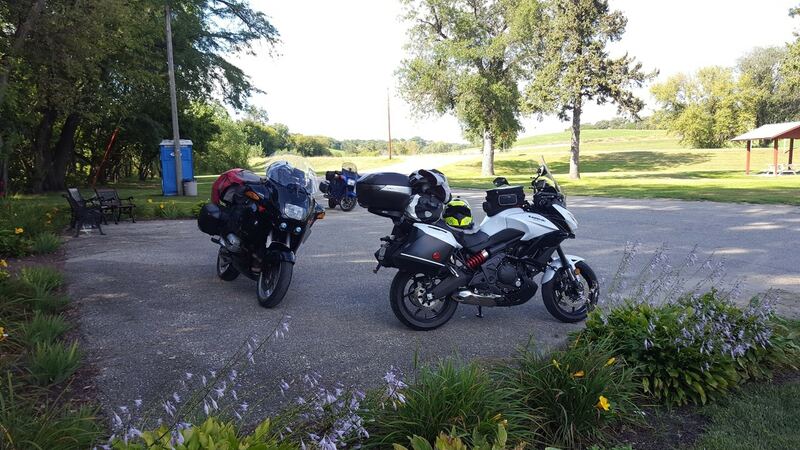 I have yet to take my Versys on a decent trip but spring will find me headed thru Wyoming to either Montana or Colorado. I have brothers in each location so a week visit will be in order. BTW - GREAT pics and story - back...! Last edited by fasteddiecopeman; 11-25-2016 at 12:41 PM. Great pics and story! I am sorry to see that happened to you. But it's good to see you got back on the iron horse. There truly is nothing else like it. I rode dirt bikes as a kid and went down in the dirt a couple times while I was learning with nothing more than some scrapes/bruises. I've been riding street motorcycles for over 7 years now and I feel blessed to have never experienced an accident or gone down on pavement. I'm not going to say I haven't had any close calls though with the multitudes of distracted drivers now a days. All I can do is keep wearing my gear/being vigilant and hope that day never comes. The postimage domain debacle has broken all the image links in my original post. :-( I've got new URLs from the new postimage site, but looks like I can't edit my post. I'm guessing they lock once they are so old. But below I'll paste an updated version with working images. ...I had such a wonderful time. 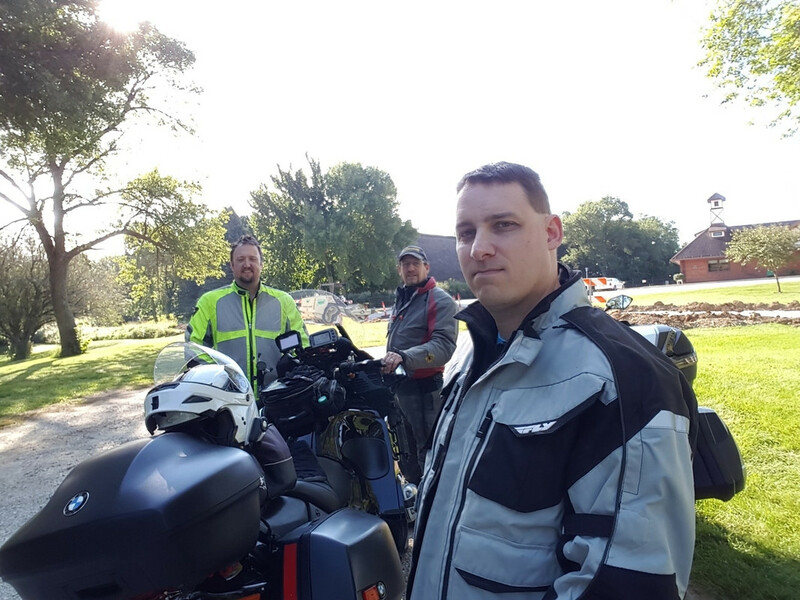 I really debated not riding again, but I enjoy motorcycle adventures so much, I can't imagine living without it. GOOD for you, and THANKS for the GREAT write-up and pics! I've never visited Iowa, but I kinda feel that I HAVE, now.